UK – Video solutions specialist Production AV will be on Stand I2E at the Event Production Show at London Olympia on 26 and 27 February to showcase the Agile Arc Lite PTZ camera integration solution from leading media server company disguise. 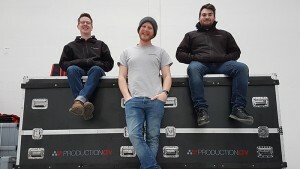 Based in Cheltenham, Production AV has been at the forefront of AV innovation for 14 years. It is inviting visitors to get hands-on with the new disguise and Agile kit at the show. In February, disguise launched the latest version of its award-winning software, used to design, sequence and control live shows and experiences. Version r15.2 now includes integrations with Agile Remote Cameras’ range of PTZ cameras, enabling live video feeds from the discreet PTZ cameras to be used as part of the visuals on impressive live events. Also on Production AV’s stand will be Desay’s X2.6i 2.6mm indoor LED modules, which can be built in both concave and convex configurations as either a flown or ground support system. In picture: The team will demo the disguise server's integration with Agile Remote Cameras’ PTZ range.